The Water Efficiency Around the Home eBook is loaded with information to help you save and store water throughout the home and garden. This book is available as a PDF download only. This publication is FREE for ATA members (please log in using your ATA webshop account). 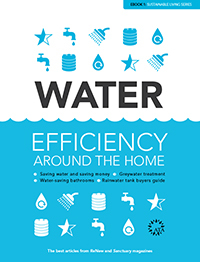 The Water Efficiency Around the Home eBook is the first in ATA’s sustainable living series with information to help you save and store water throughout the home and garden. This is an interactive pdf (3.4MB) that can be downloaded on purchase. This publication is FREE for ATA members (please log in using your ATA webshop account).